My charger for my 8fg tx has failed, which is my second. I have looked on the internet, and those that come up are out of stock. Ripmax website is not working. Any ideas as to where I can purchase a charger with a 7.2v output (for the tx) and a very small (compared with my other Futaba) plugs. Diamater approx 5mm. I got a replacement for my set from Weston UK after a second Futaba failed.it would seem they are rubbish. Is there anything special about the charger? Assuming the batteries are NiMH then any constant current charger will do the job set to (say) 100mA to 500mA (the voltage is irrelevant), ideally one with an automatic cut off when the batteries are charged. You just need a Futaba compatible connector (IIRC they were 3mm concentric on my old Futaba transmitters ie Challenger). The lead cut off your old charger will do, with suitable connectors to plug into the charger (probably 4mm bullets) and you're up and running. I assume the faulty chargers are just so-called wall-warts with a rough DC output? I really don't understand why anyone uses them when there are cheap 'proper' chargers available from places like HK which will do the job more reliably. As Rich points out, any modern field type charger would be fine. For my older transmitters I use an Overlander TS80, which is both mains or 12v DC. My newer tx's take their charge from any USB socket. I've charged those on the flying field using a 5ah Makita drill battery with a clip on USB outlet. The Futaba chargers supplied with the radio are very poor. I remember mine (supplied with 14FG) soon breaking. I always charge my Batteries from a proper “computer” program charger( modern field type as Percy mentioned) . That way you can properly monitor battery condition ( what you are putting in and what has gone out) each flying session, plus you can cycle the battery occasionally (important on Nimh) . If you “trickle charge “ that way on 200mah your transmitter battery will last much longer. At this low rate it is quite possible that the charger will not detect a peak and work as a trickle charger but a constant current regulated supply would be better - even an old fashioned "wall wart" charger may suffice if the output is suitable. I would favour peak detect charging with the occasional correct trickle charge after the charge terminates to correct any slight imbalance conditions. There again, I detest NiMH cells and try very hard to avoid their use! Will this charger do the job? I take it the outer is negative on the plug and the centre +ve. That the white stripe on the cable is the positive. Of course i do not know what the cable on the charger indicated looks like. I am pretty much assuming i can cut the Futaba plug and cable of, then connect striped wire to striped wire etc, or is that to simple? You are far more observant than me. All who advertise this charger are out of stock. I have found this, as i only want to charge my Tx, it will probably do? Erf, you must already have a charger for electric models - yes? Why not also use that for the Tx ? Primarily it is about convenance, as my electric charger used for models is a single model type. The second reason is again about convenance, in that i dislike all the button pressing and menu scrolling i already have to do, just using Lipos. Weston UK do a range of chargers of the type you want Erflog. I have now purchased the Airsoft intelligent charger. The principle reason is that their charger has a Delta Peak charging regime. Time will tell if my decision is a good one. The leads have been cut, the new charger lead soldered to the old charger plug. 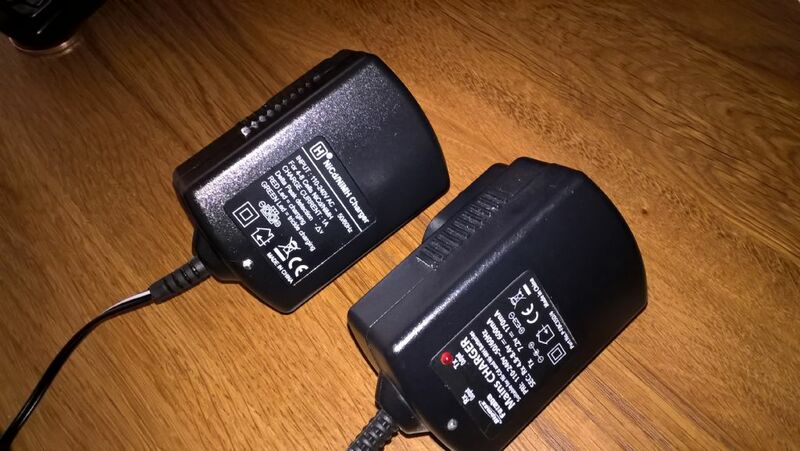 Here a picture of the new and the old chargers, it seems that everyone use the same enclosure, I guess it is what is inside that changes. Sometimes a lot, other times not much. The good news with the charger is that it works. That soldering white stripe to white stripe was conventional, where no body decided that there own convention would be better. The other good news is that the delta peak worked, in that the diode changed from red to green after probably an hour and the voltage shown on the Tx was 8.4v. I have not bothered with the multimeter.